This post is written for Reliance Digital and Indiblogger. "Ste! We are in need of a green planet and we should try to go the E-way,"
Sud said to me and probably Sriram seconded his thoughts. The female execute at the reception directed us to another executive (probably the store manager) Suresh. We showed him the e-invitation (yes, name invented by us) which I had got through email from the Indiblogger folks. "Sir! You need to provide us the hard copy of this mail," Executive Suresh said. "I know but in haste I forgot to carry the copy and I am coming all the way from Pune!" I said with a sad face. Sriram's sharp eyes soon spotted a HP printer next to him. "If you don't mind can you give a print of this mail," Sriram said. Executive Suresh thought for a while and finally agreed to get a print copy of my invitation. Sud mailed him the invite and the executive asked me to write my name and mobile number on the hard copy of the invitation. He instructed us to visit the store and take an experience. It was a very friendly environment. We first started with the first floor where there were variety of electronic gadgets and home appliances ranging from Air Conditioners, Refrigerators, and electronic razors, Dry and Steamed Irons, Hair dryers etc. We quickly visited each section one by one starting with the refrigerators. Sriram inspected them one by one while Sud visited the Iron and the Razors section. His eyes scanned through the razors. Sriram and Sud discussed about the brands - its pros and cons while I fidgeted with the SLR's and the DSLR's. "Sri and Sud! Guys check this out," I said to my friends as my eyes focussed on the Nikon D90. "Such a beauty man,"I added further. "Indeed!" Sriram and Sud said in unison. Sriram checked the Canon camera while Sud was fascinated with the looks of the Sony Cybershot cam. They checked the cam for the different specifications and talked about the lenses and technicalities. We then walked down to the ground floor. "Can we click photograph's here?" I asked the Store manager. "No Sir! Photography here is strictly prohibited," he replied back. As we walked down the stairs, an ensemble of store executives at the first floor smiled at us. Ground floor hosted a series of mobile phone brands, Televisions and Game Consoles, microwave ovens and what not! There were at least one sales executive assigned to a particular section to assist and guide you. We first visited the mobile phone section where we witnessed the smart phones from the Nokia's, Samsung’s, Sony's, Intex's, Micromax's etc. It was sheer delight to the eyes to get a glance of all popular gadgets at a single venue. We checked the mobile phones one by one. Sriram started with Nokia Lumia as I tried to get my hands on the Samsung Galaxy S4. Sud was busy searching for the IPhone 5 to demonstrate us the thumb slide feature of the Apple's latest offering in the mobile world. The sales representative explained us about the different technical stuffs of the phone. We then treaded to the Television category where we saw a wide gamut of TV’s ranging from different brands and costs. There were 3D LED TV's and we tried the 3D glasses to get experience of how the Television works. It was indeed sheer bliss! "Such a delight to the eyes, Sri!" Sud said to us after he saw the Sony Television which looked like a beautiful painting on a canvas. "Chic and sheer elegance personified!" Sriram replied. Cash-backs and EMI's. It was indeed a good experience at the Reliance Digital Store at the Times Square building at Andheri East. As we left the store, the store rep at the entrance smiled at us and said, "Do visit again!" "Of course there is a reason to visit this store...a best experience all together!" I said and both my friends nodded in agreement. Sri left for Mulund. Sud and I were famished, so we decided to acknowledge our hunger by visiting the nearest MacDonald outlet outside the T-square building. In short, a wonderful experience. 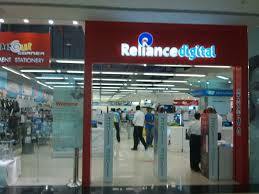 Thanks to Indiblogger and Reliance for this fabulous 1.5 hours at the Reliance Digital store. Image taken from Google Images!